I just made Strawberry Red Wine Brownies for the Dixie Crystals Brownie Dessert Contest for the Food and Wine Conference in Orlando, FL July 19-21. The prize is a full conference pass to the Food and Wine Conference AND the winning dessert will be the featured dessert of the conference. The recipe will ALSO be featured on both the Dixie Crystals and Imperial Sugar websites. UPDATE (7/22/13): I won! I WON! See the brownies on Dixie Crystals website! Since this is a food AND wine conference, I'd be remiss if I didn't add wine to my recipe. I really like wine. Not as much as beer, but I really enjoy drinking. One cup in the recipe and one cup for the chef. Drink. Drank. Drunk. I may or may not be tipsy while typing this. Just kidding! I will save my drinking for post-blog writing. My original plan was strawberry jam, rose water and red wine. I scrapped that plan early on. Rose water is very exotic and expensive. And even though I have plenty, I wanted to create something with a wide appeal. I thought long and hard about how to incorporate wine into this recipe. I didn't want to add wine to the batter and mess with the texture of the brownie. The only brownies I ever make are pumpkin cream cheese brownies at Halloween time. K.I.S.S. and go with what you know! So cream cheese became the vehicle for all of the flavor, ribboned through this chocolaty delight! Dixie Crystals corporate chef, Eddy Van Damme, will be judging this recipe. All of the recipes. And then he'll select the winning recipe from all eligible entries. To make the red wine reduction: Place 1 cup red wine in a small saucepan over medium-high heat; bring to a boil. Cook until reduced to 1/4 cup (about 15 minutes). Place wine in a bowl; let come to room temperature. Spray with baking spray or lightly grease and dust with flour, a 9x13 in. pan and preheat the oven to 350ºF. Make the cream cheese: Place the cream cheese in a standing mixer and beat until fluffy. Add 1 egg, 1/2 cup of sugar, 1/2 teaspoon of vanilla, 1/4 cup red wine, 1/4 cup strawberry jelly and 1 Tablespoon of flour to the bowl. Mix that up until all smooth. Set this aside while you prepare the brownies. Make the brownies: Mix together the butter, sugar, eggs, and vanilla until smooth. 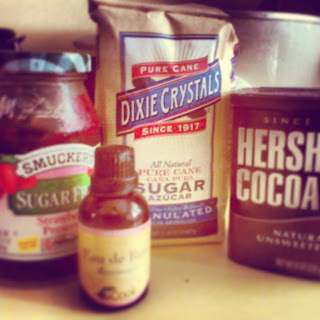 Mix together the cocoa powder, salt, baking powder, and flour in a separate bowl. Add the dry ingredients to the wet ingredients by whisking until combined. Stir in the chocolate chips (if using). Pour one-half of the batter into the pan. Use a knife or an offset spatula to spread the batter into corners of pan. 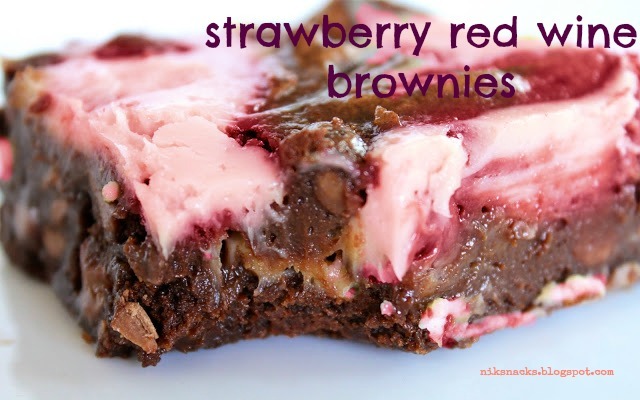 Pour cream cheese mixture over the batter and then pour the additional half of brownie batter over the cream cheese. Swirl the batters together decoratively with the tip of a knife or spatula. Bake for about half an hour (between 26 and 30 minutes). Test brownies before removing from the oven. Stick a toothpick in the center of the pan. Ready = toothpick is clean with a few moist crumbs. Not ready = the toothpick has batter clinging to it. Overbaked = toothpick comes out completely clean. Let cool completely before slicing. And eating. Love the combo of red wine and chocolate! Good luck with the contest! Thank you Renee! Hopefully, I'll be seeing you in Orlando! That is a wild recipe! It's so inventive. I would vote for it. Good luck! Very creative Nikki! You can have your wine and eat it too! Maybe I'll see you in Orlando. Yum! These look so good and scream summer! See you tomorrow! Safe travels to Florida! Love it! Can't wait to recreate this in my kitchen. Pinning! This is causing me to drool! LOL Thanks for sharing at LOBS! I am wondering if there is a more popular chocolate used for this recipe? Semi-sweet, dark chocolate, or milk chocolate chips? I used semi-sweet chocolate chips in this recipe. 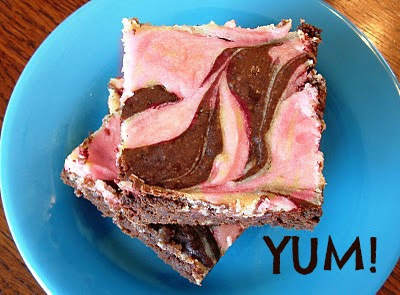 I am so making this dangerously yummy brownie today!